B&B Cultivation, the leading provider of thoroughly tested, pure medicinal cannabis is excited to open its doors on 1259 Roosevelt Trail (route 302), in Raymond, Maine, and is having a Grand Opening Bash to meet our community. Please join us October 12th and 13th for festivities, food, refreshments, art, neighbors, raffles and more. Get your certification at B&B on the spot between 6 p.m. and 8 p.m. on October 12th and between 2:30 p.m. and 6 p.m. on October 13th. There will be a Chamber of Commerce ribbon cutting October 12th at 4:00 p.m. and you are all invited! 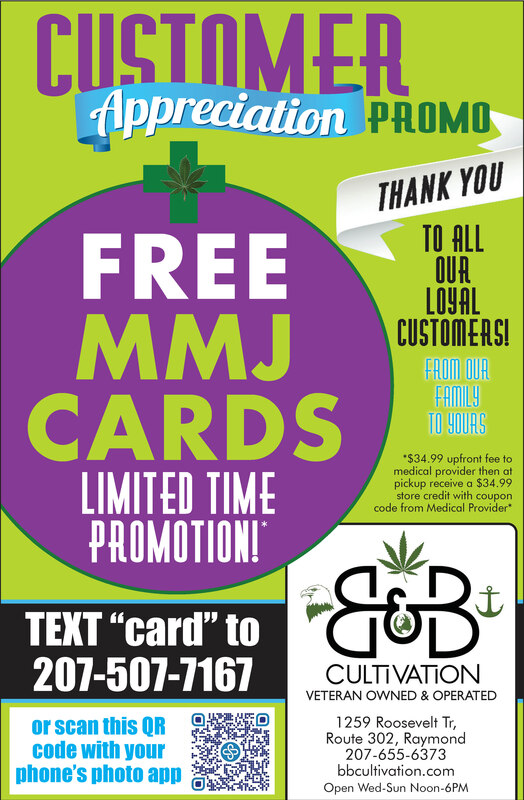 The store provides flower, edibles and other fine products to ensure a healthier and symptom free life for those with MMJ certification and proper ID. Also available are essential supplies, a full line of non-psychoactive CBD products such as lotions and salves, fine art, glassware, and more; even call ahead pick up is available for those who qualify. The active component of the cannabis plant, cannabinoids, have shown to inhibit tumor growth and kill cancer cells in lab testing. Medical cannabis contains antispasmodic qualities which relax muscles and has shown to be an effective treatment for seizures, and for these cannabis oils that are rich in cannabidiol (CBD), are the preferred method for treatment. Patients who suffer from chronic pain caused by diabetes, cancer, MS, HIV, and other diseases have been turning to medical cannabis as a way to treat their pain without the use of addictive pharmaceutical medications. Also available, Delta 8 is great relief without the anxiety. In recent years, opioid recovery has been blessed with cannabis, saving valuable lives. Repeat customers rely on the purity, potency, consistent high quality, and value B&B offers its community. In order to provide pure medical quality cannabis, free of metals and contaminants, molds and other harmful pests, growers need pristine environments. Though thorough testing, technology and science have improved the process, many cannabis providers regularly opt out of testing their medicine; some even pass off simply unhealthy products and get fined hefty sums. B&B Cultivation is different, and we designed it that way. Recirculating Deep Water Culture (RDWC) Hydroponics was developed by NASA and uses no soil to grow in outer space. Plants grow quicker and are more resistant to bacteria. Plants are not wasting valuable time trying to find a specific nutrient or avoid a stone. The custom system assures the ability for constant analysis, consistent exact nutrient dosages, and real time adjustment capabilities in case nature finds its rough spots. There are no pests, no molds, and precise controls, yielding the most reliable, consistent and powerful product. We use energy efficient full spectrum LED lighting. LED lighting insure the plants get the exact wavelengths they need at the right times. LEDs offer a broad and balanced light spectrum. Conventional grow lights generally peak in some color spectrums and are lacking in others, giving the plant an incomplete and/or irregular spectrum. LEDs produce vibrant plants that have more powerful hues and varieties of natural color. The LED systems save lots of energy as well, producing only the wavelengths of light beneficial to the plant, also making them the environmentally friendly choice for cultivation. A state-of-the-art security system at the offsite grow facility and the retail shop, assure the safety of our community and the medicine. B&B is veteran owned and operated. They graciously provide military veterans twenty percent off their purchases with proper identification, and proudly thank those who serve for their contribution to our nation. As believers in quality lives for everyone, no matter your station in life, a loyalty card provides those with fewer resources, a way to earn quality rewards. We are so grateful to the many friends and neighbors who have visited as we built our gallery and want our space to be a center for both wellness and community. A nurse practitioner will be available every Thursday evening for certification, adding to the convenience for many locals seeking to get relief. We want to meet our community, and celebrate a new neighbor, fine art, and the purest, most potent and most consistent medicine to exist in our state. A toast, refreshments, raffles, delicious food, an onsite nurse for certification, conversation with master cultivation experts, and a ribbon cutting will welcome Maine’s new neighbor to the Sebago region. Join us, October 12-13, 1259 Roosevelt Trail, Raymond, ME 04071, on 302. Can’t make it? Find us on Facebook, Instagram, or at www.bbcultivation.com!